Vanquish Guitars which is synonymous with The Guitar Lounge in Peterborough is widely known as the place to go for musicians. 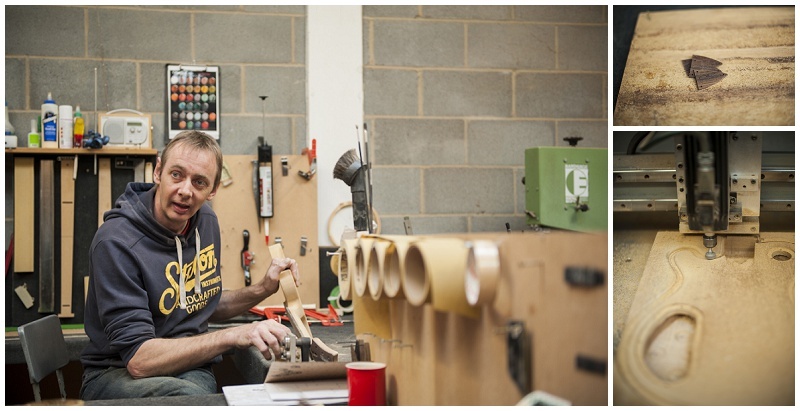 Owner and master luthier at Vanquish Guitars, Adrian Hardman is incredibly knowledgeable about his trade and his handmade, custom guitars are recognised as exquisite pieces, winning many awards. Adrian has allowed me to see the ‘behind the scenes’ at his workshop and watch him make one of his renowned custom guitars. 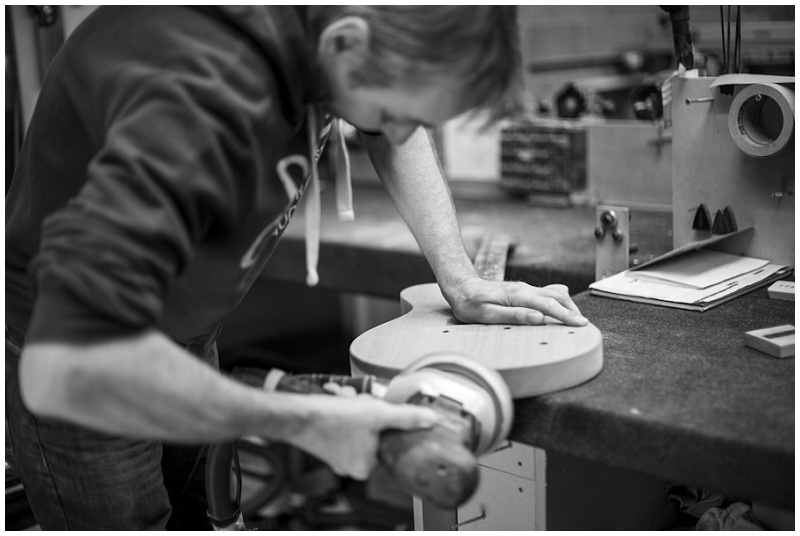 Coming up with innovative methods for making his guitars, his process is highly specialised in order to achieve the finish and sound that Vanquish is known for. The guitar Adrian will be making is a Vanquish Classic. It’s an entirely new model by Vanquish, and not only that, but this guitar is a signature, custom spec of the Classic, destined to be played by a gigging musician. Already this new model is showing itself to be a popular guitar, attracting a lot of interest and the order book is filling up fast. Two types of wood have been chosen for the body (mahogany with a maple top). Adrian has already hollowed out the mahogany, then glued and clamped the thinner maple block to the mahogany. The two pieces together make up the main body of the guitar. 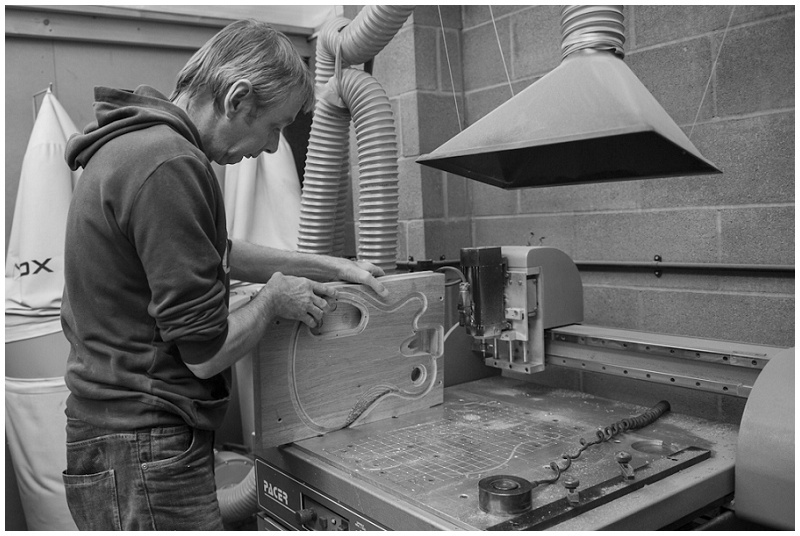 Using CAD and a CNC machine, Adrian can produce his guitars to within one hundredth of a millimetre – absolute precision. He starts out by cutting the neck pocket. The body contour is cut out at the same time, just a few graded passes which will be sanded down to make a smooth curve later. Whilst the CNC machine is working, the positioning of the F hole is tested by drawing it on in pencil. 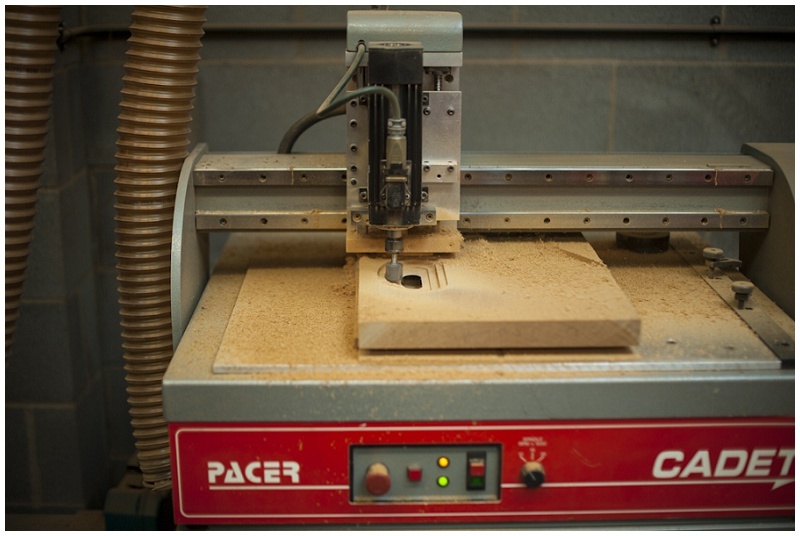 Once the size and angle of the hole is determined it can be drawn up in CAD to create the correct profile for the CNC. Meanwhile Adrian works on another guitar, meticulously sanding it down with different grades of paper until the surface is completely smooth. Starting with a courser grade, he sands the whole body by hand by wrapping the sandpaper around a small block of wood. He repeats this process with progressively finer grade paper. For each different process of machining the body, Adrian changes the tool used by the CNC machine. To calibrate the tool the CNC tests the depth of the cutting tool using a pressure pad to ensure a consistent depth is cut each time. 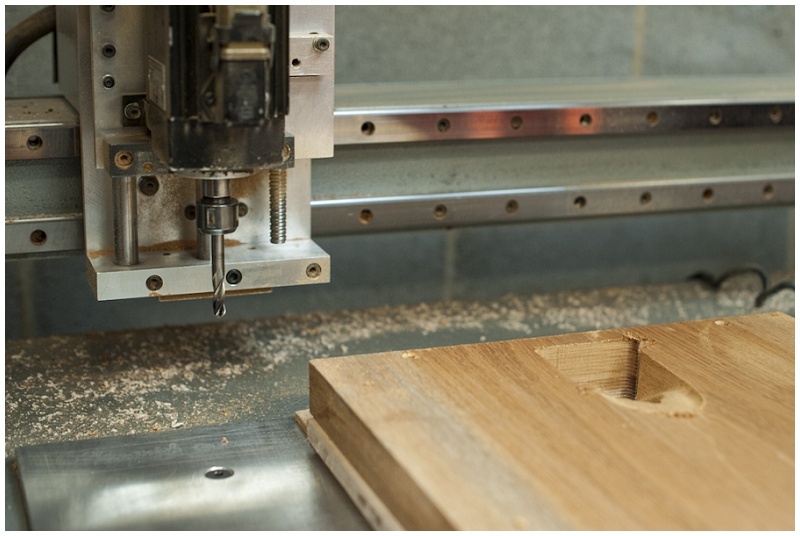 Adrian uses a CNC machine as it can work with such precision that you won’t find a more consisent fit or closer connections between the wood any other way. Adrian changes to a bigger tool, this time to hollow out a place for the electrics and circuit board. A separate hole is made for the pick up switch. It’s at this point I got my first look at the hollow body – you can see right inside the guitar. I’m fascinated by the attention to detail in Adrian’s work. He uses an electric sander across the other guitar he’s working on, and once he’s done the surface feels like silk. 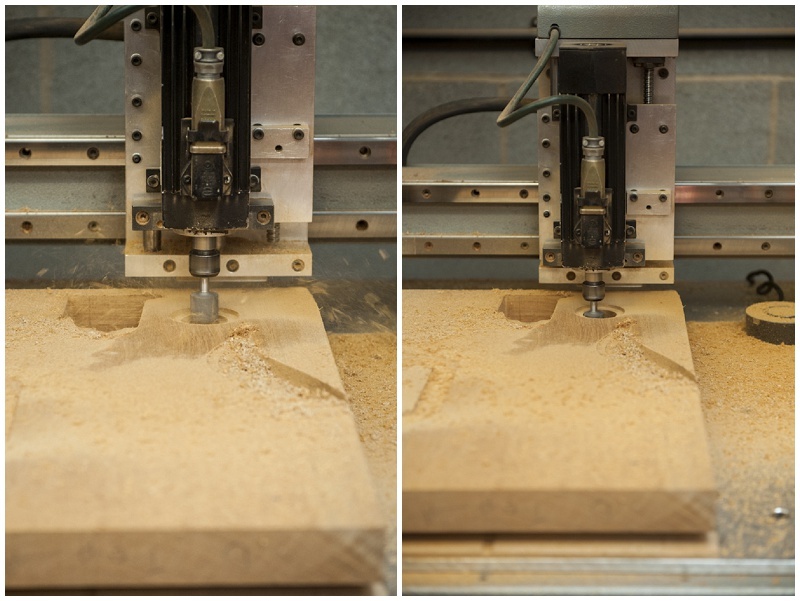 By now the CNC has cut layers down into the guitar to make a rear electronics control cavity, and Adrian cuts out the remaining wafer thin piece of wood by hand. This is so the tool doesn’t splinter the wood once it reaches the hollow of the body. A deeper cavity is drilled to connect the volume and tone pots to the circuit board. A very small tool is used to create slots for the circuit board, another example of such precision in Adrian’s work and why Vanquish guitars are known for their quality. It’s now at the stage where the shape of the guitar is coming together. The edge of the body is cut out with two different tools, the first making the radius (the curved edges of the body) and the second cutting the depth of the outline. 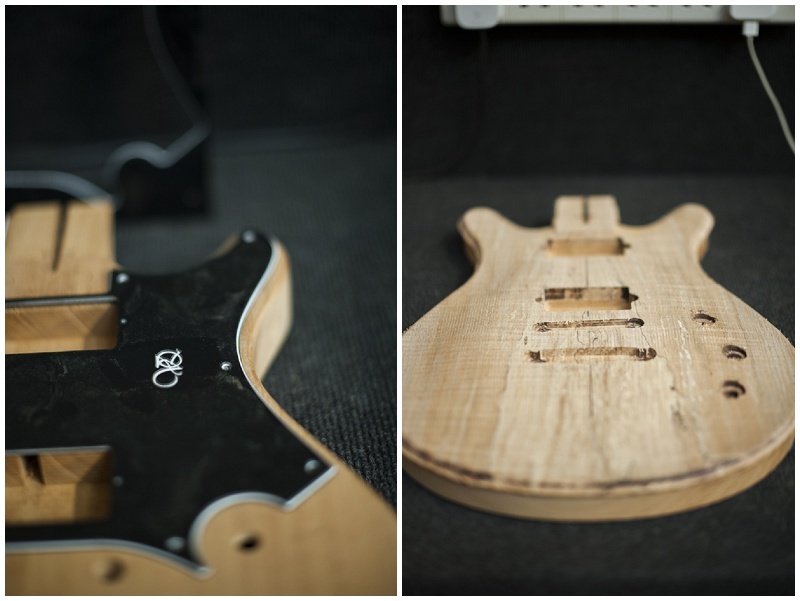 Whilst I was in Adrian’s workshop I could see some of the other guitars he is working on. The guitar on the left is another signature custom guitar, with a custom pick guard designed by Adrian and his client together. 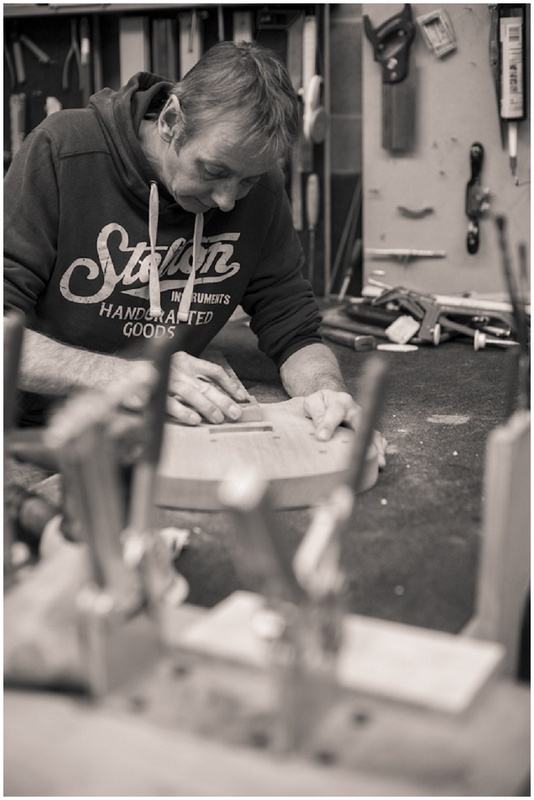 A complete outline has been cut into the back of the body, so Adrian checks the guitar over and empties the shavings from the hollow body before turning the wood over for the outline to be engraved into the front. 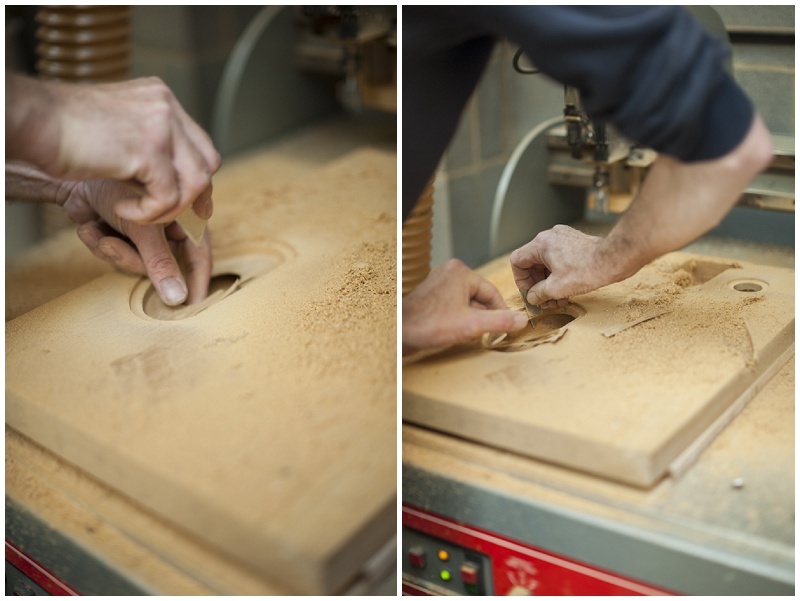 The F hole has been drawn up in CAD and its placement is tested again by engraving the wood. 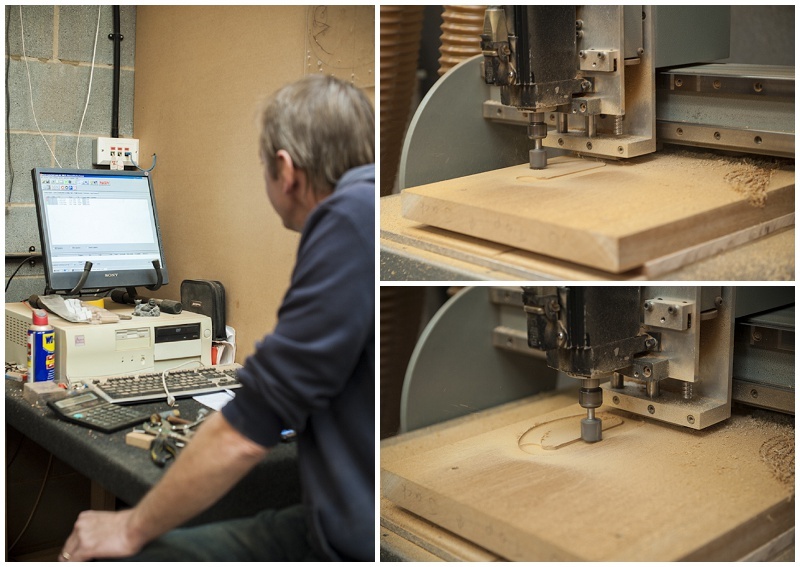 Adrian programs the CNC to drill just millimetres into the wood, such a shallow engraving the F hole, pick up holes and outline are drawn around in pencil so they stand out. The F hole is positioned perfectly first time, so Adrian changes to the biggest tool of the day and thins the block of maple by cutting deeper into the surface. As on the back of the body, the shape of the body is drilled, then the pick up holes are fully cut out. Finally, the F hole is cut out in stages, with each pass the tool cuts deeper into the wood until the hollow of the body is reached. With the machining stage of the body complete, the next step is to machine the neck and then glue the neck to the body. By the end of the day, Adrian has a finished body ready for the next chapter. We had a look at the guitar, placing P90s into the pick up holes to really get a feel for how it will look once it’s complete. Next time I see Adrian he will be working on the mahogany neck and headstock, and rosewood headstock veneer and fretboard. To find out more about Adrian’s guitars, visit www.vanquishsounds.com.